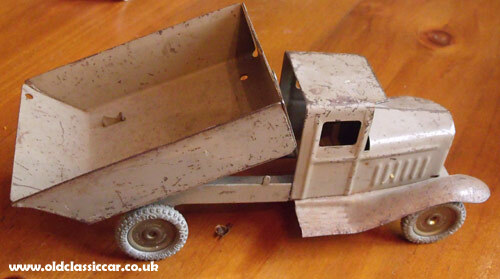 An old tinplate tipper lorry. This interesting old lorry has been on the "unidentified" shelf for quite some time, I'm hoping that a reader of this page will one day be able to confirm who exactly produced it. Overall it measures approximately 9.5 inches in length, and is made of steel throughout. 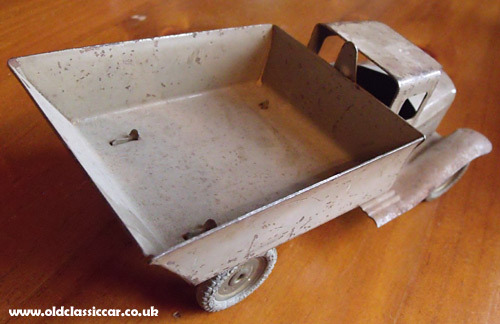 There are no maker's marks anywhere - not an original one anyway, the wheels and tyres are by Meccano, but they look like non-original replacements to me. The date of the lorry could be anywhere between the 1930s and the 1950s. 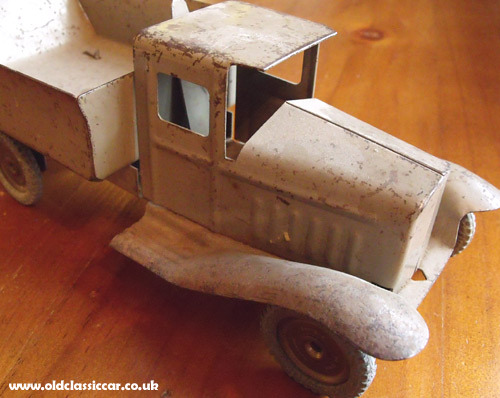 Its shape is reminiscent of various manufacturers' pre-war tipping lorries, including a number of Citroens, and Ford's Model AA of the late 1920s and early 1930s, to a certain extent. A sprung catch on the rear of the cab keeps the rear body in place, and prevents it from tipping its contents until required. The front wings and the chassis are formed as one. To it the front axle and axle mounting are attached, each separate piece located by bent-over tabs rather than rivets or screws. 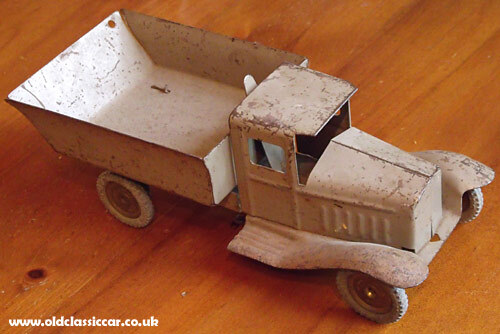 The cab, bonnet and grille are formed from one piece of metal, into which bonnet louvres and the outline of the two cab doors have been pressed before being fitted to the chassis.